This recipe was originally for a 10-pound block of blue cheese at the restaurant but I have reduced it, the best I can, for a 1/4-pound piece of blue cheese. You can experiment a little to shape this recipe to your tastes. I hope you enjoy it! Mix mayonnaise, sour cream, vinegar, buttermilk and garlic powder in a bowl. Melt Blue cheese in a skillet over medium heat till almost liquified, (leave some chunks of cheese un-melted) take off heat and cool. 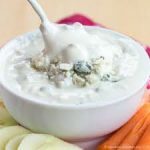 Mix blue cheese with the mayonnaise mixture till fully blended, pour into a jar, cover and keep in the refrigerator.Makes about 1 pint.